When diagnosing problems, capturing and displaying small temperature variances makes all the difference. Comtest now offers Fluke’s Ti480 and Ti450 PRO series infrared cameras, recently fine-tuned to make it easier for technicians, engineers, and electricians to get to a problem’s root cause faster by identifying hot spots, cold spots, and apparent surface temperature differentials, with a higher degree of confidence. These IR cameras have increased thermal sensitivity to capture minute differences and the latest Fluke technology for on-screen clarity, making it easy to visualise field issues. With the enhanced measurement accuracy and the wider dynamic temperature range of the Ti450 PRO – up to 1500°C with NETD as low as 25 mK – technicians can collect precise information for making informed decisions that boost the company’s return on investment. 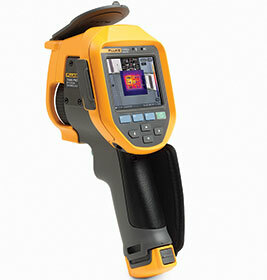 The Fluke PRO series cameras introduce a leading-edge visual infrared experience with intuitive user interface. The units feature increased thermal sensitivity that captures the smallest measurement differences, the latest technology for on-screen clarity, and lens compatibility to capture targets from small to large. Now, with the Ti450 PRO, worrying about focus is obsolete. MultiSharp focus captures images that are focused throughout the field of view, even if users start from a completely blurry target. The camera takes multiple images and combines them to give a clear, accurate focus on targets, near and far. The advanced focusing system enables users to capture an automated, focused image of multiple targets at once, delivering the image clarity needed by professional thermographers and maintenance managers to produce top-quality results and avoid costly rework.